This kit consists of 30 pieces in a soft leather case. Pieces include 2 pieces of each plug and jack for UHF, Mini-UHF, N type, BNC, TNC, SMA and 6 pieces of Universal Adaptors. 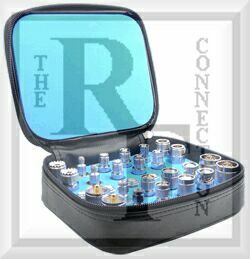 All connectors come with nickel plating, teflon dielectric and gold pins. This kit consists of 30 pieces in a soft leather case. 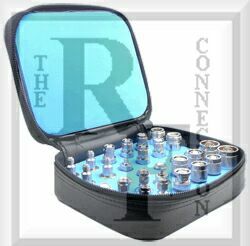 Pieces include 2 pieces of each plug and jack for N type, TNC, SMA and 2-TNC male RP, 2-TNC female RP, 2-SMA male RP, 2-SMA female RP, 1-BNC male, 1-BNC female, 1-MMCX male, 1-MMCX female, and 6 pieces of Universal Adaptors. This kit consists of 40 pieces in a soft leather case. Pieces include 2 pieces of each plug and jack for N type, UHF, TNC, MINI UHF, SMA , BNC , RCA, F and 8 pieces of Universal Adaptors.